Our new original and unique AV spray formula leaves a perfect matt and self levelling finish, designed to respect and bring forth even finest details of the models and miniatures. The Vallejo Hobby Paint Spray assortment includes 3 Basic colors, 19 Fantasy shades, 5 WWII AFV and 4 WWII Infantry colors. The new Spray Colors are a perfect match to the equivalent shades available in our Game and Model Color ranges, so both painting techniques can be combined. Each Hobby Paint Spray shows the original color applied on the colored ring around the top and is equipped with 2 different nozzles; one with a low discharge flow, especially recommended for fine lines and small details, and the other with a medium discharge flow, recommended for thicker lines and for covering larger surfaces; the low-pressure valve allows for excellent spray control. Low discharge flow. Especially recommended for fine lines and small details. Medium discharge flow. Medium line. Recommended for thicker lines and covering larger surfaces. Hello, when the Hobby Paint sprays will be available? Lookin’ forward to It! 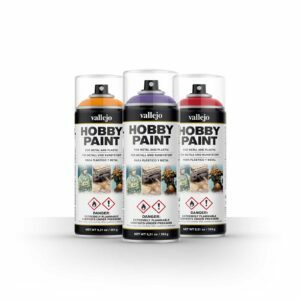 The Hobby Paint Spray es now available. You can take a look at our distributor page to find out your local store. This looks like an interesting time saver, personally I’m a big fan of using a spray can like this for a fast start. The 2 kinds of caps are intriguing to me, that seems like a brilliant idea. Must try! Yes Hobby Spray Paint will be available in the near future. You will be able to get this product and other products at this link https://www.squadron.com to get this product. Can this spray be used as a primer for models, or is it just recommended for base coats? Thanks. Yes you can use it as a primer as well. In fact, you have white, grey and black into the category BASIC. Where can I see the full range of these sprays ? Yes, it will be available in the UK. Yes, Hobby Spray Paint will be available in the UK.